Successfully Added OTT TV Box - Android 7.1, DLNA, Miracast, Airplay, Amlogic CPU, Wi-Fi 4K, Kodi 17, Wi-Fi, Google Play to your Shopping Cart. This Android TV box has everything you need to turn your plain old TV into a smart TV entertainment system. The Android 7.1 OS brings access to games and apps aplenty with dedicated streaming and media apps from the Google Play store such as Hula, Netflix or the preinstalled Kodi, as well as countless games. With DLNA, Miracast and Airplay all supported you can even stream content directly from your mobile devices letting you enjoy a larger screen for playing Smartphone games, sharing pictures or watching films. The OTT TV box is equipped with the popular Amlogic S912 octa-core CPU which features 4 cores running at 1.5Ghz and 4 running at 1GHz. 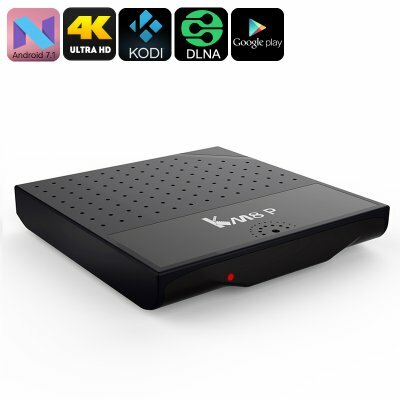 With this and a dedicated Mali-T820MP3 graphical processing unit, the TV box can support 4K resolutions without stuttering or dropping a frame. This pocket-sized TV box is about as small as they come, weighing under 100 grams and taking up less room than a standard wallet. Its the best TV box to slip it in your pocket and you can take an Android computer with you, great for holidays, sharing content at a friend's place or turning that hotel room TV into a smart workstation and media hub. With Wi-Fi connectivity, it is quick and easy to connect to your home network and the 8GB of onboard storage is complemented by a micro SD card Slot so you can add 32GB of extra memory. USB ports bring further connectivity for memory pens or controllers and with the AV out you can enjoy a batter audio experience than your flat screen TV could provide alone. The OTT TV Box comes with 12 months warranty, brought to you by the leader in electronic devices as well as wholesale Android TV Boxes and media systems..